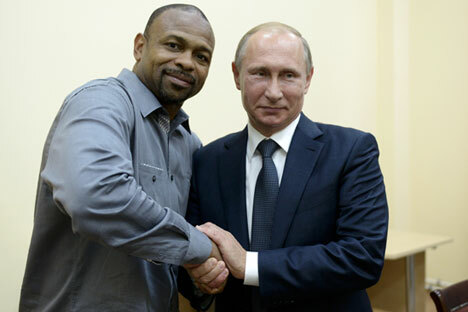 American former world boxing champion Roy Jones Jr. is expected to fill out an application for Russian citizenship in the city of Yalta, Crimea, on August 20. American former world boxing champion Roy Jones Jr. wrote an application seeking Russian citizenship in Yalta on August 20, an Interfax correspondent has reported. In his application, the boxer requested Russian citizenship based on Articles 13, 14 or 41 of the law On Citizenship of the Russian Federation. Before signing the application, the boxer said he is hoping his decision will help build bridges between Russia and America. In the "reasons for taking citizenship" column, Jones said that he wants to become an active citizen of Russia, that he loves Russian society in the same way as it loves him, and taking Russian citizenship will help reduce the gap between the two countries. The application was written during a press conference before the international boxing show Fight at Mount Gasfort, which will take place on August 23 as part of a bike show organized by the motor club Night Wolves. Jones will be a special guest of the show. The show organizers previously said the event would be held indoors in Yalta instead of at an outdoor venue in Sevastopol due to a rain forecast. The boxer's producer Vladimir Khryunov said Jones will keep his U.S. citizenship after taking Russian citizenship. "Russian legislation allows dual citizenship. He will keep his U.S. citizenship," Khryunov told the press conference where the boxer wrote his application for Russian citizenship. Russian President Vladimir Putin met with Jones in Sevastopol on August 19 and promised to grant him Russian citizenship as he conducts a considerable amount of his activities in Russia. "If you intend to tie a significant part of your life to activities in Russia, we will, of course, be happy and we will gladly grant your request for Russian citizenship," Putin said. The boxer, for his part, said sports can help build bridges between Russia and the U.S.